SARATOGAâ„¢ - The most trusted and tested name in chemical protective clothing. BLÃœCHER GmbH, a German company based in DÃ¼sseldorf, together with its U.S. licensee TEX-SHIELD Inc. are internationally renowned in the NBC defence industry. The heart of our business is the continuous development of the SARATOGAâ„¢ technology - the world market leader for permeable NBC Protective Clothing. SARATOGAâ„¢ is a unique patented composite filter fabric based on highly activated and hard carbon spheres fixed onto textile carrier fabrics. With a carbon density of between 180g to 220g per square meter, it is the maximum on the market, providing a minimum of 24 hours protection and at least 45 days of wear under battlefield conditions, including several field washings. Over 85% of the sphere's outer surface is freely accessible to harmful gases, resulting in an extremely rapid and firm adsorption. Over 7.3 million suits have been sold to 31 nations and 17 out of 26 NATO member states protect their forces with SARATOGAâ„¢. Since 1997, SARATOGAâ„¢ has been the standard for all U.S. Forces as it was the only technology to fulfil the stringent requirements of the JSLIST Program ( J oint S ervice L ightweight I ntegrated S uit T echnology Program). SARATOGAâ„¢ include Egypt, Saudi Arabia and Kuwait. SARATOGAâ„¢ NBC protective garments can be worn under all climatic conditions with minimal impact on combat effectiveness. 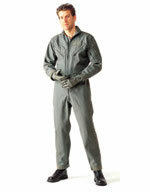 The JSLIST suit was tested at 10 locations worldwide including arctic, tropic and desert environments. The better the wear properties of a protective suit, the longer it can be worn for preventive protection without fear of serious loss to operational strength. The microclimate between skin and clothing has a great influence on the wearing properties. The pore structure of the SARATOGAâ„¢ spherical adsorbers and their hydrophilic properties has the effect that sweat impulses are caught and continuously decomposed. This causes a low increase of humidity and a low atmospheric humidity in the area very close to skin and for that reason is pleasant to wear. The high flexibility of SARATOGAâ„¢ filter materials leads to a "pump effect" which increases the microclimate, i.e. a quick exchange of the air in between the inner and outer textile layers. 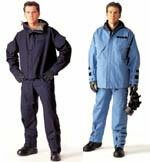 The suits are also highly air permeable meaning sweat and heat stress is reduced. SARATOGAâ„¢ has a very high mechanical stability - guaranteeing reusability. 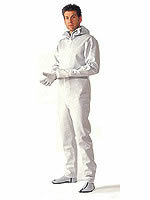 Due to excellent mechanical properties, SARATOGAâ„¢ protective suits can be used for training purposes without problems; after being washed and packed, the protective suits are fully suitable to be re-used. Annual controls prove that more than enough chemical protection exists even after 15 years of storage under correct conditions. undergarments (worn instead of underwear in combination with regular clothing). Garments are also available in flame retardant versions. NBC protective gloves, socks and hoods complement the range of SARATOGAâ„¢ garments. sets consisting of a SARATOGAâ„¢ garment, protective gloves and overboots in a protective carrier bag. We can also offer R & D support and manufacturing assistance. Alongside military users, civilian organizations such as civil defence, police, fire fighters, EOD, coast guard and inspectors (OPCW and UNMOVIC) use our garments. From an economical aspect, SARATOGAâ„¢ is the best NBC protective garment system money can buy: garments can be worn up to 45 days and laundered over 6 times under field conditions; together with a storage time of at least 15 years and its logistical advantages, SARATOGAâ„¢ demonstrates by far the lowest life cycle costs. 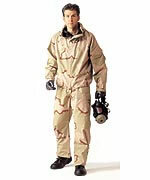 Chemical Protective Flight Coverall CWU-66/P of the US Air Force. Overgarment for the US homeland defense (the HAMMER Suit in navy blue) and overgarment worn by the OPCW inspectors (in light blue). Overgarment for the US Forces (JSLIST Suit). 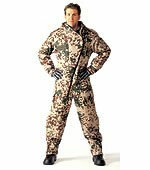 Overgarment for the German Army.